Aizawl, Mar 23 : Mizoram government has been making arrangements to start the final repatriation of around 3,000 Bru families lodged in six relief camps in neighbouring North Tripura district, an official said today. Additional Secretary for Home Lalbiakzama told PTI that the state government had prepared Road Map-IV for repatriation of Bru refugees from Tripura and submitted expenditure proposals to the Union Home Ministry. "Arrangements were underway to begin the process as soon as the Centre releases the fund for the repatriation," Lalbiakzama said. He said that the Bru refugees were proposed to be resettled in Mizoram-Tripura-Bangladesh border Mamit district, Mizoram-Assam border Kolasib district and south Mizoram's Lunglei district bordering Bangladesh. Once repatriated, the Bru families would be resettled in their respective villages where they stayed before they migrated to Tripura and if their original village was abandoned, they would be resettled in a village within the same assembly constituency, he said. Officials of the three districts said that more than 2,000 Bru families were proposed to be resettled in Mamit district, a little over 650 families in Kolasib district and more than 200 families in Lunglei district. State home minister R Lalzirliana earlier said that a meeting convened by Union Home Ministry in New Delhi on January 30, attended by representatives of both Mizoram and Tripura governments decided that the Brus in the six relief camps in Tripura should be repatriated within six months. "The meeting also decided that those Bru families who refuse to return to Mizoram during the time-frame should allowed to remain in Tripura, deleted from the voters' list in Mizoram while the Centre would close down the relief camps and discontinue the free ration provided to the inmates of the camps," Lalzirliana said. Brus migrated to Tripura from Mizoram during the later part of 1997 after militants belonging to the erstwhile Bru National Liberation front (BNLF) gunned down Lalzawmliana, a forest guard working inside Dampa Tiger Reserve near Persang hamlet on October 21, 1997. The first effort to repatriate the Brus from November 16, 2009 was not only hampered by the murder of a Mizo youth, Zarzokima of Mizoram-Tripura border Bungthuam village by Bru militants on November 13, 2009, but also triggered another exodus. 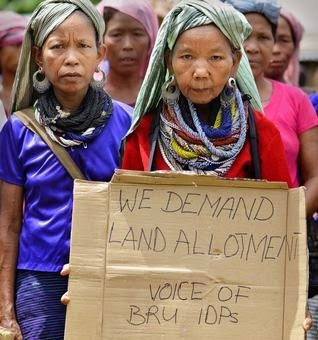 Hundreds of Bru families have been repatriated since 2010 but many of them refused to return to Mizoram due to obstruction from anti-repatriation leaders who made a plethora of demands to the Centre and the state government.